I bought this in a shop in New Zealand in 1980 for $1850.00 would love to know anything about it. It is 700 cm high with a fluted top and the large meddlie is approx 1200c. The largest vase I know of is a modern vase made in China recently. If I remember right it was at least 2.5 metres high. Goodness me what a surprise I always thought it was Chinese how exciting wonder if anyone else could tell. It is large and I often wondered if it was made in pieces and somehow joined together. I'm afraid I cannot help with this one. 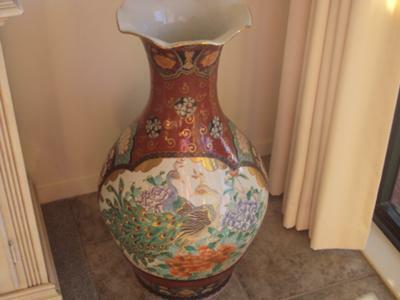 This definitely is a Japanese vase not a Chinese one. I have no knowledge at all on Japanese ceramics. You could try the asianart.com forum. I know there are some people knowledgeable in Japanese ceramics there.